The PC-3000 SAS 6 Gbit/s Professional System is the newest and the most powerful solution for recovering data from damaged HDDs with SAS (Serial Attached SCSI) and SCSI based interfaces, for capacities from 18 GB to 10 TB, for file systems FAT, exFAT, NTFS, HFS+, APFS, EXT2/3/4, XFS, ReiserFS, BtrFS, VMFS, UFS1/2, ZFS, DHF4.1, WFS0.x (for video recorders) and virtual machine images. The new generation of the PC-3000 SAS 6 Gbit/s Professional System for recovering data from SAS and SCSI HDDs works with HDDs at the maximum possible speed – it is limited only by the speed of the HDDs. No other product recovers data from SAS and SCSI as fast and efficiently as the PC-3000 SAS 6 Gbit/s. 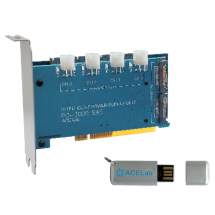 The PC-3000 SAS 6 Gbit/s is a must-have solution for companies that recover data from SAS and SCSI and want to do it with the most sophisticated tools and techniques available in the shortest time possible. The PC-3000 SAS 6 Gbit/s Professional System consists of the PC-3000 SAS 6 Gbit/s hardware-software and the Data Extractor SAS software.